For Linda Grabel, donating her vacation home was easier than she anticipated. Linda Grabel thought it would be difficult to donate her vacation home to charity. As it turned out, she never had to leave the comfort of her home to close the deal. 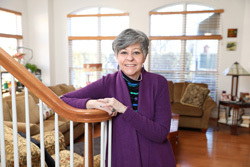 "I was amazed at how easy it turned out to be," says Linda, who late last year donated her vacation home in the Pocono Mountains of Pennsylvania to benefit National Jewish Health. "It was interesting because the transaction was done through the internet, phone and mail." Linda purchased the Blakeslee, Pennsylvania property for her parents initially; and she later rented the home to tenants. When the property became a burden to manage, she decided to gift the house to charity. Blakeslee is more than four-and-a-half hours away, by car, from Linda's home in Rockville, Maryland. "Trying to fix a place up long-distance is difficult," she says. "It was time to do this." As a retired attorney with the U.S. Department of Health and Human Services who has experience working with health care policy issues, Linda believes in supporting nonprofit health care. She chose National Jewish Health because she is a longtime supporter who knows the hospital is dedicated to helping children and adults from across the globe find answers to their complex lung, heart, immune and related diseases. "I know the financial devastation that happens when a family has a major illness," Linda says, noting she has donated to National Jewish Health and other health care charities for many years because it makes her feel good to help others. "I think it's important to support nonprofits in the health field because these organizations really make a difference in people's lives." For Linda, gifting her unwanted real estate relieved a huge burden and provided an advantageous tax write-off based on the fair market value of her property. Like many nonprofits, National Jewish Health has a conservative real estate acceptance policy. To relieve the risk without losing the benefit of these valuable but complex gifts, the institution worked with Realty Gift Fund (RGF), a new nonprofit exclusively dedicated to accepting gifts of real estate of any type, anywhere. RGF assumes the financial burden to hold and fix a property through resale, then grants the bulk of the resulting proceeds to National Jewish Health. By using RGF's experience and resources, National Jewish Health is able to actively seek real estate gifts throughout the country. According to Linda, "a substantial gift went to National Jewish Health, and the entire process worked out rather well." If you are in a similar position as Linda was recently and have a second home or any other type of real estate you no longer want to manage, consider gifting it to National Jewish Health. To learn more about supporting National Jewish Health, contact Gordon Smith, MBA, CFRE at giftplanning@njhealth.org or 1.800.423.8891, Ext. 6549.